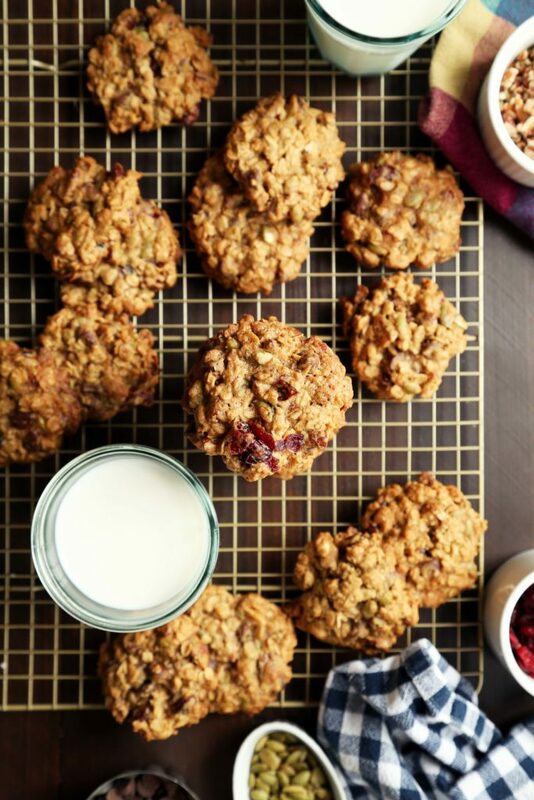 I’m not going to tell you that these are the world’s best oatmeal cookies. I won’t tell you that this is the only recipe you’ll ever need until the end of time. I’m not going to tell you that I’m omg obsessed or anything like that. I will tell you that I was trying to re-frame cookies into my everyday life. What’s the cookie that I want to eat everyday, any time of day, with hot coffee or cold milk? What’s the cookie that might give me a little second-cup-of-coffee-mid-morning-treat energy? What’s the cookie that I could offer someone that drops by? What’s the cookie that’s hearty enough, and chocolate-y enough to satisfy a craving in one cookie, not a cookie binge? Well… I didn’t tell you all this because I failed. We’ve arrived. This is the cookie – hearty but chewy, sweet with a bite of salt, loaded with nuts and chocolate. It hits all the spots and we’re in it for the everyday. 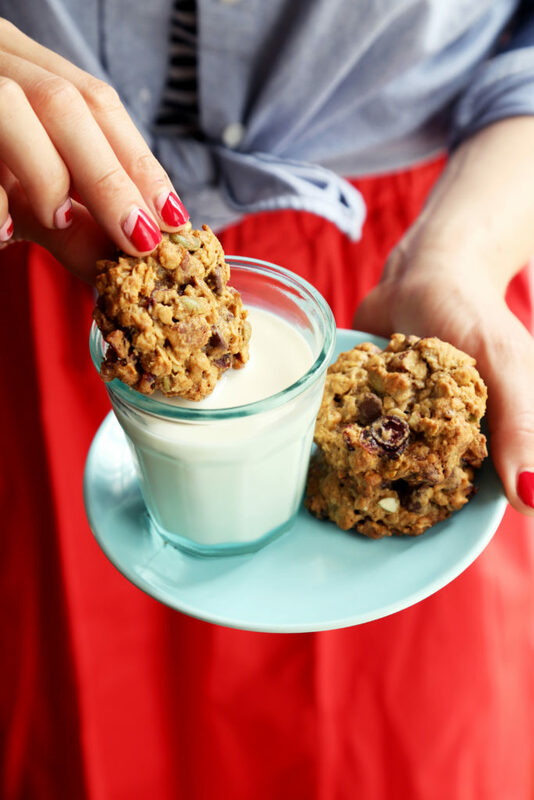 • Oats – I like the heartiness of old-fashion oats but if you want a softer cookie, go for quick oats. • Brown Sugar and Butter – queens. • All kinds of fruit and nuts: dried cranberries, toasted pecans, and roasted and salted pepitas. • Spiced, too! Warming winter spices. Into the bowl with softened butter and brown sugar. I used a set of electric hand beaters and whipped the two together. We’ll need an egg for binding though you could certainly make a flax or chia seed egg for these cookies. The seeds would blend in well with the rest of the heartiness. I went extra spicy for these cookies. Cinnamon and freshly grated nutmeg, of course. But why not add a side of ground ginger and allspice for warmth? You could, you should. The dry ingredients are lightly whisked further and added to the creamed butter, sugar, and eggs. You know how cookies go – this is just like that! And lots of everything else your flavor-brain wants: dried cranberries or dried blueberries, roasted salted pepitas (they’re pumpkin seeds! ), roasted pecans, and lots of chocolate chips – YES! It’s understandable if there’s spillage or a few oats go flying. We’re done with the hand beaters though, just go in with a spatula here. It’s also totally understandable to nip a few tastes of cookie dough out of the bowl. It’s living on the edge because wait… we’re not supposed to eat raw flour now, or eggs, and sometimes spinach, and we’re not supposed to hold our phones to our heads or our ovaries, and definitely don’t stare at the sun or swim in a dark lake… listen it’s hard to keep track of everything, let’s just do our best. I dolloped the dough right onto a parchment lined baking sheet just after the dough came together. It didn’t need to rest in the refrigerator because there’s really so much in this dough. Scoop generous dough balls onto parchment lined baking sheets and flatten the cookie slightly, giving it a little spread before it hits the oven. After a cozy 12 minutes in the oven the cookies will be lightly golden around their edges. Salty and sweet and chocolate studded and just everything I want to eat. And – these cookies keep their chewy bite for days! I keep them around, wrapped and ready and I humble suggest you do too. Jon and I took these photos for you. In a large bowl, combine softened butter and brown sugar. Beat together using an electric hand beater until slightly more pale and fluffy. This will take about 3 to 5 minutes. Add egg and beat until thoroughly combined.. Add the vanilla extract and beat until blended. In a small bowl whisk together flour baking soda, spices, and salt. Add the flour mixture to the butter and egg mixture slowly beating on low speed until just incorporated. Stir in the oats, cranberries, pecans, pipits, and chocolate chips. Place racks in the middle and upper third of the oven. Preheat oven to 350 degrees F.
Bake for 10 to 13 minutes or until they’ve reached your desired doneness. I like mine a little underdone and cook them for 10 to 11 minutes. Allow to cool on the cookie sheet for 5 minutes before transferring to a wire rack to cool completely. Or you could just eat them warm. That’s probably the best idea. Store in an airtight container at room temperature for up to 6 days, if they last that long. Previous Post: « Let It Be Sunday, 159! This weekday NEEDS a cookie. These look so good! This recipe looks daunting with the number of ingredients and all. I would love to see the word “PRINT” so I can study the recipe as.a whole. Hi Terry! 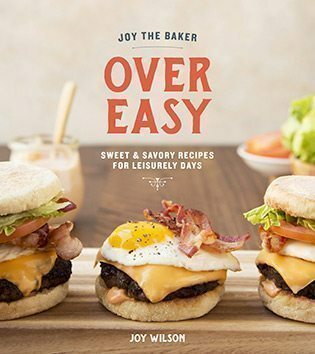 There’s a print button right under the title of the recipe in the recipe card towards the bottom of the post. I think it’s rather easy since you’re not chopping the berries and nuts. Just take them out of the container and toss them in. Might seem like a lot of ingredients, but it’s not a lot of prep work, so actually its a great recipe because I’m sure the end results will seem like you put in a lot of effort. Oh boy! My dream cookie! 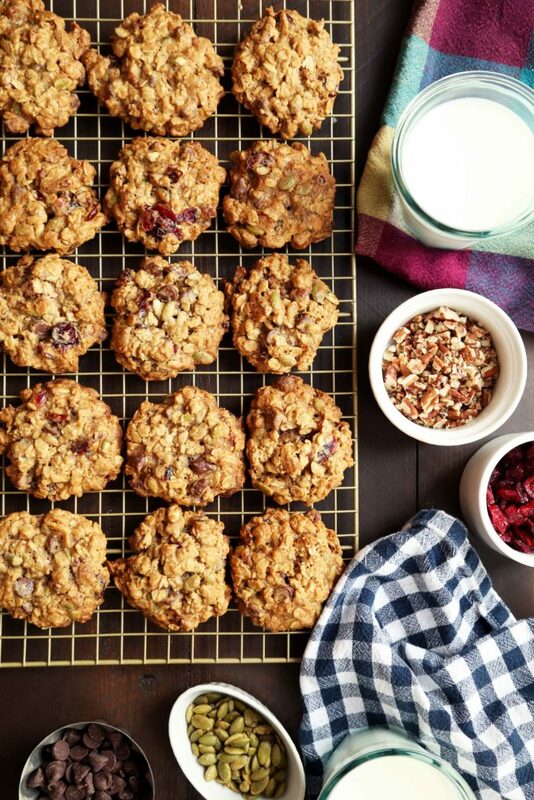 I love oats & spice & nuts & fruits – I’m making these today, on this cold morning. Perfect! Great looking cookies Joy! All of the family LOVE oats- we get through so much! Just wondering if you would be able to provide alternatives to the cups? I always convert recipes to grams and while it’s not that hard it means I have to either write it down with the weights or convert it every time. I know so many people in the UK who love your blog but everyone I know bakes with weights! I do love it that in your cookbooks weights are provided ? I’m excited that I can use a flax egg here–what about Earth Balance instead of butter, too? Or would that take it too far? I think you could get away with both Earth Balance and a flax egg! Can I substitute coconut oil for the butter? I second the weights request! A scale is so much easier to use than measuring cups. No clean up!!! It IS hard to keep track of everything. Thanks for the LOL this morning as I read this. I often live on the edge when making cookies–how else can you check for quality without a taste of the dough? These sound delicious. How did you KNOW? 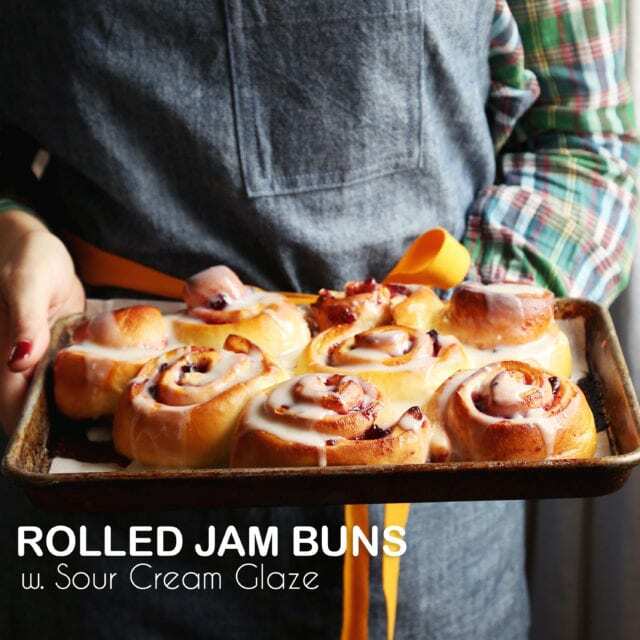 These are exactly what I was craving this weekend…now I have the recipe to address it! Thank you Joy! I used to use the oatmeal cookie recipe on the lid of the quick oats box, but this one sounds and looks so much better. I love a cookie with lots of texture and you’ve nailed it. Thank you so much. 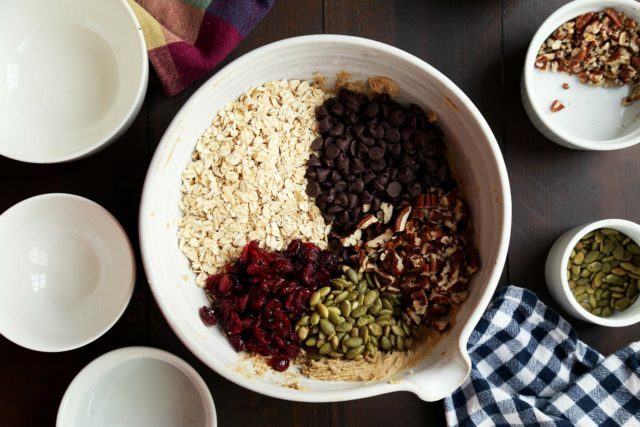 You could even just add all of the nuts, fruit, and chocolate to your existing oatmeal lid recipe, ya know? These look fabulous. I gave up sweets for Lent but as soon as Easter rolls around, I am in! This can easily be made gluten free – thank you! What did you use? 1 for 1? Yay, no raisins! These cookies sound divine. Love the descriptive way that you write. I saved us all from the raisin. God bless – why serve squashed flies to those you love? So glad to see an oatmeal cookie without raisins. I am trying (TRYING) to avoid sugar: refined, honey, whatever. Sugar begets sugar cravings and more sugar. But oatmeal…I’ve put it into all kinds of things. Mixing with grated veggies (carrots, zucchini, beets) keeps the result from resembling concrete. I’ve been doing savory muffins for breakfast, with oatmeal, whole wheat flour and beets. No sugar! Really good. 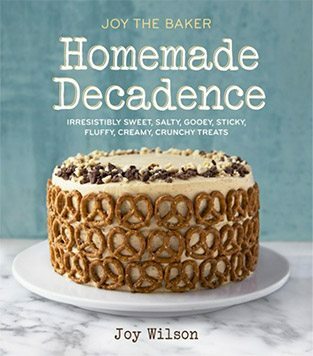 In the bowl of an electric mixer fitted with a paddle, cream together butter and sugars until fluffy. Add eggs, beating well after each addition, until fully incorporated. Add vanilla. Add flour, salt, baking soda, baking powder and mix just until combined. This is a heavy batter, so if there’s a little flour in the bottom of the bowl, don’t worry – you’re gonna use some muscle in a bit. Add coconut, dried fruit, and oats and use that muscle some more and mix just to combine. Prepare two baking sheets by lining them with parchment paper. Divide batter into 12 equal portions – I used a ? cup measuring cup that worked well. Place each cookie dough portion on your prepared baking sheets and chill in the fridge for one hour. Bake in the preheated oven for 18-22 minutes. Depending on how gooey and soft you like your middles, I did about 20 minutes. Cookies always continue to cook a bit after you remove them from the oven so you really don’t want to over bake these! Let cook on a rack and store in an airtight container. These make 12 GIANT cookie – big enough to split (only if you want to!). I don’t have a clue of the authors proper name.. but I love these.. I love everything with oatmeal and therefore I know for sure that these cookies are really my taste!